Ridi, Pagliaccia! Sr. Kane smiling, through her tears. National Catholic Fishwrap has published a talk by Sr. Theresa Kane. It is about what you would expect, a sustained and blinkered whine. It never ceases to amaze me that these people can’t see they are galumphing along toward oblivion in a group-hugging assisted-suicide pact. Honestly, I hope these women eventually do find some peace. They are obviously confused and tortured souls. Sr. Kane is internationally known for her 1979 welcome to Pope John Paul II during his first visit to the United States with an appeal for the inclusion of women in all ministries in the church and her subsequent public support over the years for the ordination of women. She began her talk with a brief history of the current biblical scholarship to recover the figure of Mary of Magdala from layers of distortion in order to recognize her role as a significant leader in the early church. [I bet that was a hoot!] 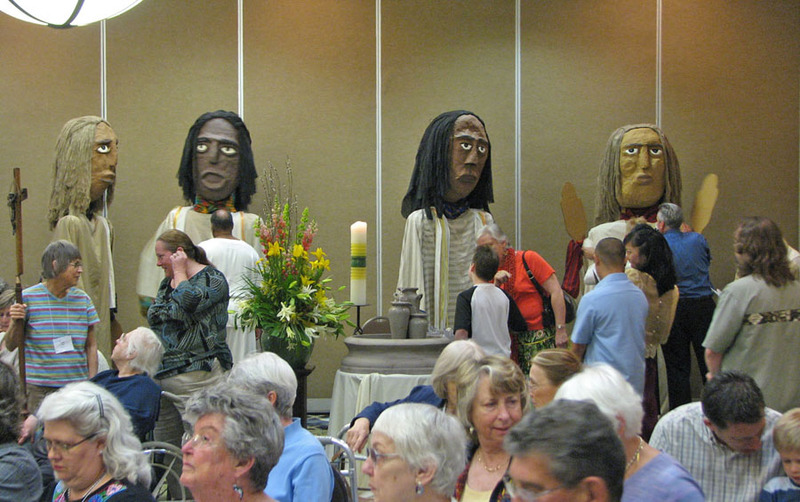 Sr. Kane praised the organization Future Church, founded in Cleveland in 1997, for its work in assessing the projected impact of the priest shortage and promoting creative approaches [I suggest big puppets.] to meeting the church’s need for liturgical and pastoral leaders. Sr. Kane reminded her audience that Mary of Magdala is mentioned prominently in all four Gospels as a companion and disciple of Jesus, one of a group of women who accompanied and supported him in his ministry, were present at his death and burial and the first witnesses to his resurrection. Mary’s status as “the apostle to the apostles” was celebrated in the early church and is still preserved in the Eastern church. But by the fourth century in the West, as part of an official suppression of female leadership, Mary of Magdala was represented in sermons and iconography though a conflation of scriptural passages that identified her primarily as a prostitute and public sinner. “Let us place ourselves for a moment in the garden where Mary was. This is a woman who has just experienced the torture and most brutal form of death of a very close friend, [Notice how she diminishes the LORD, reducing Him to "friend" status. Modernists always reduce the supernatural to the merely natural.] a death that was indeed an execution, capital punishment, [It was, Sister, deicide.] with very few supporters. The disappearance of people after his death and burial was more out of fear that they would be captured and arrested and perhaps tortured. “Let me speak now of the women of our Catholic community today. Why do we weep? [sniff] Without the full incorporation of women into leadership, discipleship and all church ministries — which was the vision of the church council — without full incorporation into and participation at the liturgy, [BUZZ WORD ALERT…] we do not experience community as women at liturgy, [LOL!] and we do not experience life-giving worship. Our presence at liturgy has become and continues to be a source of anguish, sadness, even emptiness. [The Anglican Church is ready! Go to them! They are waiting to heal your brokenness, dry the tears of the womany community of weeping…ness.] We continue in severe tension over the basic language to describe humanity, and this has gone on for decades, the sexist language that we refer to as exclusive language The continued use of terms like ‘man,’ ‘his,’ and ‘mankind’ denies our very presence. [It’s ineffable, sister.] It certainly doesn’t give recognition and respect; and we are surely invisible. [If only.] The anguish, the distress, the absence of a sense of worship in community has gotten much more severe. “When I was president of the Leadership Conference of Women Religious, we were called to Rome and been having meetings with the Vatican year after year after year, since before 1970. If anyone wants to know why this (current) investigation is happening, they have not been listening for 35 years. [I bet that was a laugh line, too.] We have done it repeatedly. So much so that we say, why should we do it again? But, good women that we are, women religious, we go back again. A very difficult issue. “That’s the mindset. How do we have a conversation about that? We need to weep. [The… just… get on with it. Tramuta in lazzi lo spasmo ed il pianto / in una smorfia il singhiozzo e ‘l dolor, Ah!] There is a sense of ignorance about the human aspirations of women to be adult, mutual collaborators. “But the real tragedy is that a magnificent opportunity is lost for a bishop to gather with a group of women to worship together. “As a Catholic woman, I continue to hope. Why? At gatherings such as this for these three days, [three … whole… days…] I hear so many women and women who are so open and want to make this a new church. So I go home having been inspired. I don’t really have a need to run back to traditional worship. [Remember that this is a matter of perspective. For her, you could have just about any wacko thing take place, but if there is a male priest, it is "traditional". See how language shifts depending on the context? But remember: they are open! They are sooooo open. Would they be open to a man presiding at their non-traditional self-expression liturgies? I have a learnéd dubitation about that.] There are many organizations that are very much alive, spiritual and Vatican II: Call to Action, Women’s Ordination Conference, Future Church., [AND…] the congregations of women religious ourselves. [That, friends, may suggest a reason for the Apostolic Visitation. Am I reading too much into it?] In many ways we are a counter organization within an organization. “Women still me stories that are shocking. ‘I can’t drive when he is in the car. He still pays all the bills, and I have to get some money from him.’ This goes on on a regular basis. “But basically I believe that the congregations of women religious have much more equality and I think that the renewal that took place in our communities brought about that equality. [Minor detail: You are all old now and there are no new vocations.] We worked hard at this for many years. [And look at all the wonderful empty convents you have made.] I think that alternative communities are worshipping and are also ecumenical, which is a major breakthrough. Vesti la giubba, …. e la faccia infarina. Finally, I think it would annoy Sister and the editor of NCR were you to follow me on Twitter or buy me a cup of coffee. Just the thought of it…. I am delighted to report that a few people have sent donations through the coffee cup icon! Let the annoying begin! I am even more delighted to be able to report that even more readers have sent liberal-annoying donations using the coffee cup icon below or the button on the side bar! This entry was posted in SESSIUNCULA, Throwing a Nutty and tagged LCWR, Sr. Theresa Kane. Bookmark the permalink. 80 Responses to Ridi, Pagliaccia! Sr. Kane smiling, through her tears. I want to comment on the article, but I can’t get over Pavorotti’s take on this aria. Breathtaking. Apologies for the irrelevance. Liturgesy: heresy expressed through ‘worship’. I just CANNOT understand these women!! They qualify for the the succinct verdict an internal auditor pronounced on completion of an investigation some years ago of a male accountant – “he’s so stupid he doesn’t even know he’s stupid!”. Change the pronoun…..
Two year children throwing tantrums are more mature than these silly women. Your candle burned out long before, your legend ever will. This lady is a nut! I am amazed she has not been removed from her position. This kind of stuff only reinforces the SSPX and their members. I know if reinforces why I only go to the Extraordinary Form of the Mass in a traditional parish. I am insulated from this nuttyness and it is just shocking that these people call themselves Catholic. I am a child of the 70s. Nuns like these catechized me…and as soon as I was 17, I was outta there! It took Benedictine monks, three years later, to get me to see the real face of the Church. These women have nothing to offer but themselves, and that’s simply not enough! In Boston, seriously, our Confirmation classes focused on JFK, RFK, and MLK….the trinity of secular saints!! What spiritual poverty! Immediately a Far Side comic came to mind: God at the computer, with Sister pictured in the monitor, His finger poised over the “Smite” key. …not that I don’t wish Sister to convert and get to heaven. But this image DID come to mind unbidden. Ah but Canio is a tragic figure — a man with a broken heart, poisoned by grief, who stoically plays his comic role. The giubba represents his public persona. But Kane is a farcical figure – a clown who feigns a tragic fate. The poison in her heart prevents her from fulfilling her proper role as a nun. She doesn’t have to put on a costume; her costume is the non-religious attire she wears in public. I do feel a modicum of sympathy for her plight. Her patron saint, Mary Daly, is dead and this senescent bunch of her caterwauling devotees will soon be gone too. Vincerem’, vincerem’! Ma mi manca molto Luciano! That really is the crux of all of this isn’t it? Those who are in support of a decision that could not be any clearer, miss the point of what true equality is. Equivalence, in my humble opinion, is subject to equality and not nearly as important. Women are truly equal to men, but they certainly are not equivalent AND VICE VERSA!!! Case-in-point (and oft used), as a man, I cannot be a mother. I cannot bear children and I cannot nurture a child the same way a woman can. That doesn’t make me any less equal, but it does have a factor regarding equivalence. My potential role as father is not equivalent to a woman’s role as mother, but it is as equally important in the life of the child. Your whole point is well made, as per usual. Actually, St. Mary Magdalene was weeping because she thought somebody had taken away the Body of her Lord. Dear Sister, if you don’t want to be Catholic, then please cut to the chase and leave. We don’t _want_ you to leave, but if you’re insistent that this is not the Church for you, then why beat around the bush? How long can one woman whine? Once Sr. Kane realizes that the 30 years she has spent beating her head against the wall without making any progress is a sign she’s headed in the wrong direction, perhaps she will be able to truly make a contribution to the Church and the faithful. Humility. Obedience. Charity. Faith. The cornerstones of Christian life. I list humility first because without it we cannot truly have any of the others. Thus is the problem with Sr. Kane, Fr. McBrien, Sr. Chistler, and the rest of the NCReporter cast of malcontents (not that this publication has a lock on the malcontents by any means…): they all have the illusion they are right and the Church is wrong. Funny, I don’t recall Christ giving any of them the keys to the gates of heaven nor promising that any of them would prevail against all evil. All of the above are obviously intelligent and articulate individuals. The problem is they have chosen to use these gifts to further their personal agendas rather than the work of the Church. In doing so they not only misuse the gifts granted to them by God, but they lead countless others astray — souls they will be held accountable for. I ask that everyone reading this pray that they will open their hearts to the Holy Spirit and work for the Church instead of against it. I don’t know whether I can finish! It would be painful w/o your humour Father! This woman needs to get acquainted with articles such as “a” “an” and “the.” The verbage of the feminist movement is bizarre. Yes, I also agree that the modernists have great difficulty in facing the supernatural. It must be reduced to material world. The Blessed Sacrament is bread. WE are the Body of Christ, not the Eucharist. It’s always US, never HIM. They can’t face that the Kingdom of God is God, Himself, the Trinity. That’s it. This idea that St Mary Magdelene has been reduced to a prostitute. Old meme. She says NOTHING new here, really. Firstly, the woman cannot think a rational, unemotional, non-sentimental thought. Secondly, because of the lack of reason, she cannot write a decent speech. Thirdly, her ideology re: womenpriests colors all her judgment regarding the Sacred Scriptures. Lastly, she is a heretic and should be removed from all active ministry, sent to an enclosed convent of traditional nuns, like those in Kansas City or near Denton, helped to repent and spend the rest of her days in silence, contemplating the beauty of the hierarchy as established by Christ, HIMself. There were three orders in my area I would have joined, one Carmelite, one Benedictine, and one active. When I visited these convents and joined the nuns in prayer, each order used a made-up Liturgy of the Hours based on inclusive language. The errors in word choice and in theology made me realize from what great height they had fallen. Needless to say, I was sadden that these nuns had thrown away their heritage and fallen into disobedience and pride. Fr. Z, another home-run, knocked outta da ballpark! I have watched, over the past thirty years, the decline of apostolic women religious; it is so sad; the very source of their once-thriving presence, apostolates, and “building up” of the Church in this country, before VII, has become a nightmare of dissent, lack of identity, and secularization. Sr. Theresa Kane only confirms this; the LCWR only makes things ever clearer. Religious life is in crisis; but God is ever-greater. And the new communities and traditional communities (esp. the cloistered Poor Clares and Carmelite Nuns) are going to thrive in the years to come. And boy, oh boy, do you get the impression that she wants to imply something stronger than friendship between St. Mary Magdalen and Our Lord… Da Vinci Code, anyone?? Yes, Fr. Z, your bearded women are spot on! Yesterday Fr Z wrote that he felt he may be coming down with something. He’s on top form today though! Dare I? I think so. My favourite part is the one guy dancing AS he swings the thurible…It makes me laugh every time I see it. This is a prime example of Liturgesy. What I find strange about the whole “Church besmirching Mary Magdalene” meme, is that the traditional narrative of the apostles doesn’t really paint any of them in a terrific light, being flawed sinners all. If the Magdalene really was an Apostle, with equal sacramental dignity to St. Peter, St. Thomas and Judas Iscariot, how would saying “yeah, well, she used to be a whore before she followed Jesus and turned her life around!” have any effect on the faithful? Tina in Ashburn: …Immediately a Far Side comic came to mind: God at the computer, with Sister pictured in the monitor, His finger poised over the “Smite” key…. His Hermeneuticalness, Fr. Tim Finigan, had a wonderful idea vis a vis these convents of aging, soon to disappear religious sisters. wonder if, besides simulating the Mass and Ordination, these sad women also simulate Confession? are a counter organization within an organization”. It is past pitiful that she sees this as something beneficial. ALL: Please note that a donations have come in. I am sure this will annoy liberals. There was an article by feminist theologian Mary Condren in the Irish Times recently and it was pretty much the same. I have a problem with this use of the concept of equality. Surely this is an import from legal theory but outside of law it hardly applies. In fact it is easily refuted by holding a race, an exam or any kind of test – no two people will perform exactly the same – how then can we be equal? I prefer the concept of complementarity (the feminists really hate that idea) since it acknowledges and respects difference while affirming the role of everyone. I am glad too that she reports some bishops standing up for the Church as a monarchy after our Lord did call it a Kingdom and said He was a King! Great pressure is being brought on the Church to accomodate itself to the world and the inroads are made through the concepts we share with the secular world but these very concepts can be very distructive to the Church. Good post, we should pray for nuns like this – they have’nt much time left before they meet Himself. I recall hearing that Sister Kane was so pleased with herself in lecturing the Pope on his 1979 visit, that she tried to reprise the effort in Rome. His Holiness declined to receive her! “[W]hen will the renewal come,” Sister? It is happening now. You don’t see it because you’re too busy fighting it: head down, shoulder to the wheel. Incidentally: Is that quote from John Paul I a fabrication or a paraphrase? A google search for it finds that her column is the only source google knows for it, but perhaps she monkeyed with the wording. Moon1234 writes in the comments above: “This kind of stuff … reinforces why I only go to the Extraordinary Form of the Mass in a traditional parish. I am insulated from this nuttyness.” I sometimes attend EF Masses when the opportunity presents itself—this afternoon, as it happened—but typically attend an OF Mass in a normal parish. I have never seen that kind of nuttiness. I really struggle to make sense of the leap that is often made from the novus ordo as celebrated in particular instances to this kind of nuttiness. It strikes me as almost the flipside of the coin to nut fans who impute into Vatican II all the nuttiness that was done after the council in its name, and thus criticize, for instance, the new translation as retrenchment. Like Yogi Berra, the council didn’t say half the things it said. Well, here’s the parallel phenomenon on the other side: just as the council demanded all this nuttiness, say the pro-nuts, the novus ordo demands all this nuttiness, say the anti-nuts. It strikes me that both are wrong. The novus ordo is susceptible to abuse, but it can also be beautiful and reverent, and it certainly isn’t to blame for Sister McLoony and her pals. OK, I don’t want to go too far afield here, but could someone explain WHY these giant puppets are so popular with these folks? Who came up with this idea in the first place? They are terrifying. Though maybe the folks who use them are doing us all a favor by causing us to run away screaming. Women who do this upset me, “religious” or not. Who does she think she is claiming that “the women of our Catholic community today” (that would include me, no?) are weeping over not being able to be ordained priests? What nerve to claim such a thing! Why is she so obsessed over the gender of the priest? Simply because she wants it and can’t have it. It is like my 2 year old throwing a tantrum when I say she can’t have something. The audacity to suggest I should weep over such a thing simply because I have 2 X chromosomes. It is really ludicrous. Would she likewise weep for all the men who cannot give birth? God ordained certain things to be a certain way and he did not call her into discussion on how things should be set up. Her lack of humility and encouragement of others to leave my Church is what makes me weep. And how dare she compare the weeping of St. Mary over the death of our Savior to her own inability to be a priest! Thanks for Pavarotti. Now, THAT’s inspiring! Well, I always thought Pagliacci was feeling sorry for himself in the opera. But, then, the reference to Sr. Kane is apt. Great voice, great music, majestic whining, or as the British say, whinging. How sad. I actually cried a little, not because of the so-called injustice she speaks of, but because she and her whole generation have missed the truly beautiful and meaningful point of femininity within the Church. Why focus so much on Mary Magdalene in this improper way, and not more so on Mary the mother of our Lord? Why deny our nature? Why hate womanhood so much? Why sell your soul to secular radical feminism when the true value of women the Church has always championed? How very sad. I’ll go still further afield, and observe that the “liturgical” “dancer” prancing in front of the hideous zombi puppet can’t dance. I’ll reiterate my earlier observation that these are smalltown incompetents who can only get a gig by taking advantage of the ignorance and gullibility of whoever’s in charge of this lunacy. Which leads me to SimonDodd’s comment . . . . This is not typical of any NO Mass that I’ve ever been to — our Monsignor, after biting clean through his cigar, would have blasted anybody who proposed such nonsense to the opposite end of the Greater Atlanta Metro. AnAmericanMother- Wow, so you know about dancing too! Is there any subject you or people in your family are not familiar with? This stuff is a potential danger to the faith of others and is deplorable. What does this person think is going to happen on the day of Judgment? Such antics scandalize Catholics who have been correctly cathechized. The reason Pagliacco, the clown, weeps is because he has just discovered that his wife, who is also an actress in the same traveling show, is having an affair. The show that he must perform in requires him to play the part of a betrayed husband and his wife plays the part of an adulterous wife. During the play, he loses it, slips out of character and ends up stabbing his wife to death for real on stage. Not exactly on the same level as what Sr. Kane and co. are weeping about. In regard to the “we need to call God Father as well as mother” remark, John Paul I did say something like this, though she doesn’t have the wording right (which may be important). In fact, both of his successors have also spoken of the maternal love of God. Here’s John Paul I, at his September 10, 1978 Angelus address. He was talking about the talks then taking place at Camp David between Carter, Sadat and Begin trying to achieve peace in the Middle East. E il Premier Begin ricorda che il popolo ebreo ha passato un tempo momenti difficili e si è rivolto al Signore lamentandosi dicendo: « Ci hai abbandonati, ci hai dimenticati! ». « No! – ha risposto per mezzo di Isaia Profeta – può forse una mamma dimenticare il proprio bambino? ma anche se succedesse, mai Dio dimenticherà il suo popolo ». Anche noi che siamo qui, abbiamo gli stessi sentimenti; noi siamo oggetti da parte di Dio di un amore intramontabile. Sappiamo: ha sempre gli occhi aperti su di noi, anche quando sembra ci sia notte. E’ papà; più ancora è madre. Non vuol farci del male; vuol farci solo del bene, a tutti. I figlioli, se per caso sono malati, hanno un titolo di più per essere amati dalla mamma. E anche noi se per caso siamo malati di cattiveria, fuori di strada, abbiamo un titolo di più per essere amati dal Signore. And Premier Begin recalls that the Jewish people once passed difficult moments and addressed the Lord complaining and saying: “You have forsaken us, you have forgotten us!” “No!”—He replied through Isaiah the Prophet—”can a mother forget her own child? But even if it should happen, God will never forget his people”. Also we who are here have the same sentiments; we are the objects of undying love on the part of God. We know: he has always his eyes open on us, even when it seems to be dark. He is our father; even more he is our mother. He does not want to hurt us, He wants only to do good to us, to all of us. If children are ill, they have additional claim to be loved by their mother. And we too, if by chance we are sick with badness, on the wrong track, have yet another claim to be loved by the Lord. Now, Sister Kane would undoubtedly have a cow if she knew this, but the John Paul II she apparently hates had this to say in footnote 52 of his second encyclical Dives in Misericordia (Rich in Mercy). It’s very long, so I’ll let you go to it yourself. It goes a lot into the Biblical background. This is actually just one of the many places in his writings as Pope John Paul II talked about the maternal love of God. In fact he even mentioned it in his famous recording of the Our Father. Now Benedict XVI has done the same. I won’t go looking for the citations, and I could give several (because it’s almost dinner time) but I will just say that in the portion of Jesus of Nazareth that talks about the Our Father, he also comments on the maternal nature of God’s love, in somewhat the same way as John Paul II if I remember right, but the adds the clarification that neither in the OT or NT is “Mother” ever a TITLE for God. And in fact, neither John Paul I or John Paul II had ever made it one. John Paul I did use the word “titolo” in Italian, as you see above, but he was referring not to a title of address, but “title” in the sense of a claim or right to something. We are God’s children, so we have a claim on God’s love. (We do somewhat the same in English when we say we have the “title” to a car – we have a claim on it). So maternal love of God, yes, “calling God mother,” not so much. The fact that Sister Kane doesn’t know any of this makes me suspect that she hasn’t listened to a thing a Pope has had to say since 1978. I’m pretty sure the reason she likes John Paul I is that he didn’t live long enough to say anything to antagonize her – and it he probably got in just under the wire there by dying 33 days after his election. After all, she does seem awfully easy to antagonize! I have actually started a whole series about “God as Father and Mother” on my blog, though I’ve done only the first installment so far. This has been just a preview! Esattamente! L’uno è una tragedia, l’altro una farsa. DomesticaEcclesia: I admit most priests I know seem to have a harder time understanding or relating to women, but I think that has more to do with priestly training, priestly holiness, and the more recent scandal in the church than anything. Again, exactly. In recent times, that is the direct consequence of the lavender mafia in the presbyterate and the episcopate. Fr. Z.: You are clearly a brain-washed victim of the dominant patriarchal, hierarchical slave-owner oppressor class. Acually it dawned on me after posting that the Latin for bookworm is helluo librorm. (a gourmet of books). No sin of gluttony here. The Church has always been Epicurean in the best sense. Even if there was a conversation, there isn’t the mutuality, there isn’t the respect, there isn’t the sense that indeed we are radically equal. Sr Kane and the like are simply power-crazy. They seem have no concept that those in positions of authority – the very thing they crave -, like priests and Bishops, constantly pray for guidance and the grace to make the RIGHT decisions and to tell the TRUTH about God, in all facets, and in all seasons. Past debating but not past praying for. Umm… speaking of operatic histronics, in “Nessun dorma” as far as I recall, the female offstage chorus sings: “… e noi dovrem’, ahi me, morir’, morir…” Ring a bell, sister? I know the story of Pagliacci, as it was the very first opera I experienced in my youth. I still think he was feeling sorry for himself. There is a great difference between grief and pathos. The fact that he stabbed his wife indicates his small spirit of vengeance…I see Sr. Kane’s so-called grief as pathetic and selfish as well. Fr Z, I thoroughly admire your ability to read through and comment on a text like this. I can’t make it through more than a few paragraphs without getting a headache and/or indigestion. Why, those poor girls! Somebody stole their clothes! I think Monsignor would throw a blanket over them both. And then chew out whoever asked them to perform their jazz class routine in church. Where does she get the idea that 50% of humanity are priests or working in church ministries? I mean, if you define ministry as including lay apostolates, and with all Christian lay work as an apostolate, you still can only have the percentage of humanity who are Catholics… unless she means to open concentration camps to force non-Catholics into Catholic ministry. Not exactly what I’d call inclusive. Sigh. People just don’t think before they speak. sorry, last comment for Roland..
My favorite line is still: “We have many who are moving to other protestant traditions.” As opposed to her own protestant tradition? If that is a threat to the Bishops, I say move over and let them go…silly political games these feminists play. I was recently given a circa 9180s bio of Mother Teresa. I also read Ray Arroyo’s bio of Mother Angelica. These two women are quite similar and strike such a contrast to these whining feminist-dissenters. Both Mothers were bold and assertive (if not aggressive) in pursuing their apostolates. Yet,they OBEYED and respected their bishops, even when they didn’t agree (ie, Mother Angelica wanted ad orientum at EWTN masses, bishop said no I recall). Both relied on the providence of God to meet the financial and other needs of their apostolates and were not at all shy about asking for what they needed from individuals including wealthy persons and the public officials. They gladly accepted generosity gladly given to further their apostolates. And they were motivated by their love for and devotion to Jesus. Their good works were never separate from their faith in Jesus. They, like most holy people, prayed, adored the Blessed Sacrament, confessed their sins, & received spiritual direction. I’d wager these 2 women have done more to further the Kingdom of God than any of these whining women who believe themselves so powerless without a miter and staff. These 2 Mothers exemplified (excuse quoting a Kennedy, but..) what RFK said about not asking “why” but asking “Why not?” Their visions and ambition directed toward furthering the gospel knew no bounds. As Mother Teresa said, “We do it for Jesus.” Sadly, these whining women, trapped without this motivation, have declared themselves beyond Jesus. I listened to a priest’s talk on the Internet in which he compared dissenters to “gangrenous limbs on the Body of Christ which should be amputated before they infect the whole body.” Personally I think that most of the body has been infected and just hope that somehow a cure can be found. Oh my God, where do I start!! What a load of babbledegook from the nun who seems to think that high flying criticism of bishops and anyone else in the line of fire is fine by her. Is it any wonder that nuns are disappearing in the USA. Have they lost sight of the focus of their lives, Jesus Christ, the man God who came and gave his life on the Cross? Do they not contemplate daily the mystery of Jesus who suffered the attacks of his own, the Romans and the scorn of the crowds as he was lead to his crucifxion WITHOUT COMPLAINT, WITHOUT ATTACK ON HIS ACCUSERS? Where is the humility, the example of this nun . Have they not looked around and outside the USA to see perhaps another world that is not focused on them, on their lives and their poor theology. Well might we say BRING BACK M TERESA of Calcutta. I have met her many times in India and abroad and like all her met her, she NEVER MADE ANY PUBLIC CRITICISM OF BISHOPS, THE CHURCH OR ANYONE. She attacked the scoruge of abortion and the lonliness of modern western society BUT NEVER MADE ATTACKS ON BISHOPS. Many deserved to be attacked perhaps for misdeeds, but she never did. She was an example in service, humility, prayer and above all LOVE. These modern day nuns who fail to wear any distinctive religious clothing (WHY IS THAT, FEAR), hate to live in their communities any longer, live comfortable lives and even go to hairdressers and have their own cars, just do not get it. There will be NO woman priests in the Catholic Church, ever. The Orthodox, even Buddhists and Hindus and Moslems do not have female religious leaders. So the attacks she makes are unwarranted and out of order. And to have puppets at the Eucharist just shows how much show business has taken over with so many religious communities. They don’t know where to go or what to do. Well, let me advise them. Start praying together. Start living out your vows of poverty and get real, get out of your comfortable houses and buildings and start begging for food and then see what it is like to be poor. Throw away those secular clothes and put on the habit of simplicity and look like women who take vows and are convinced they are meant to be different. At the present time they are not different. They are complaining, whinging, moaning women who have lost sight of the crucified and risen Lord. Back to basics my dear and stop the rampant criticism of the Church’s leaders in public. Thanks Fr Z for the wise commentary. Hey, that would make a cool blog name (Helluo Liborm), although I am not yet technologically astute enough to figure out how to change a Word Press user name. I am even more delighted to be able to report that more readers have sent liberal-annoying donations using the coffee cup icon at the bottom of the main entry or the button on the side bar! Every time a new donation comes in, a liberal gnashes her teeth (I am still being inclusive). A couple of decades ago a famous journalist with a high IQ and a syndicated weekly column in the Sunday supplement wrote that she believed that the last thing men deserve is to have women take their husband’s name on being married. As much as I enjoyed the challenging puzzles, I stopped reading her column then and there and I have not read it since, having been so insulted by such a display of hatred toward men. I feel the same about “sister” Kane. Aside from the generic daily prayer I offer for God to enlighten my–and His–enemies, I have no time for this woman (er… wo-person, er… wo-per-being). Re: the claim of St. Mary Magdalene as one of Jesus’ benefactors . . . I thought there was some legitimate evidence for this. Specifically the fact that she is called Mary *of* Magdala in the Gospels indicates that she was somewhat wealthy or from a high class – only people from more moneyed backgrounds would have been named like this back then. Thus she may have provided a good deal of material support for Christ and the others. I don’t know either way, but I’ve heard some perfectly orthodox Catholics put forth this theory. The rest of the article is pure junk, of course. At least Sr. Kane is pretty upfront that she and her fellow travelers have little to do in practice with the bishops and “institutional” Church. I really wish both these nuns and the bishops/pope would take steps to formally disassociate from one another. Excommunicate the nuns, and the nuns ought to declare themselves as independent from Rome. Seriously everyone would be happier (at least in this life) and it would be more honest and would end the scandal that this sort of thing gives. Wow. I’m shocked to read that she is still alive–not that I wanted her dead, but it has been 30 years since that incident where she chided the pope and then walked over to get his blessing. Poor thing. I feel sorry for her. I’ve heard of the flying nun, but now we have the weeping nun. Love the woperson. Sounds like werewolf. Late last night, I almost sent a parody of the above article, substituting Sister’s name for Mary Magdalene’s and Father McBrien’s name for Christ’s. As I am not sending it, I shall let others fill in the blanks. ‘Sister’ Kane was in my area not long ago at a CTA event-it was advertised in the bulletin of the parish where I go for Perpetual Adoration. Of course, I didn’t go-I would have been aggravated out of my skull. Gosh, she got real old-I remember her when she confronted John Paul II in 1979.
puma19-what you said! And I like your bumper sticker suggestions, lofstrr! The lady is pathetic, simply pathetic….the Sixties and Seventies are SOOOO OVER…get over it! Sorry, but no. Jesus of Nazareth was not exactly monied or (earthly)high-born yet He was referred to as such even on the plaque above His head on the cross. Comparative adjectives take -ius in the neuter. And with regard to the Sister’s spiel, misereri Ecclesiae dignetur Dominus. Several years ago, I attended a retreat at a convent. The sisters did not have a chaplain assigned to them, and a local diocesan priest offered to celebrate the Mass at the convent. They declined his offer, saying they would rather have a community communion service instead. Needless to say, several of my friends ducked as quickly as possible, and asked said priest if he could celebrate a Mass for us at his parish! I think you got that wrong Father – such silly money pandering diminishes your standings and actually delights your liberal critics. In many ways it is also an insult to your readers intelligence – but hey this is a free country – whatever it takes. It is rather simple: you keep ridiculing liberal Catholics and give your fans snark written in the red and they give you computer hardware and money. One can only hope that between the time it takes to monitor and critique fellow Catholics and communicate this to the fan base you can find the time for your personal prayers. The laborer is worthy of his hire. Or do you think that electrons are free? The NCR hasn’t taken a vow of poverty to my knowledge, and they provide a substantial forum and megaphone exclusively for dissenting (not liberal – this is not politics) Catholics. If it were not for blogs such as this, their writers’ loud and public dissent would go largely unanswered. I find the careful dissection and response to the often flawed arguments presented by dissenters to be extremely helpful. Worth at least a cup of coffee to help keep the servers turning. Your last sentence, by the way, is skirting very close to slander. DT-a somewhat similar experience happened to two Franciscan friends of mine several years ago in downstate New York, only this took place in the context of a wake at a convent. They told me that they went to the wake out of respect to the deceased Sister. The community didn’t want any priestly involvement in the services. In fact, my two friends were told that ‘someday we won’t need your [meaning the priests] services’. Needless to say, my friends said, ‘We are OUTTA HERE!’ and walked out! And one of them-who has since died-was pretty ‘ticked off’ when he told me this! neither should your giving been done in a mean spirit to do so. In my view Father got a bit carried away. No big deal – we all have our moments. Embraced our ‘enemies’ is hard for us humans – as Catholics we should at times however at least attempt to get along within our Religion. A Mercy sister……. mercy ! She’s not just threatening, you know. When she talks about home churches and apostasies what she talks about is real. And we have not educated our laity well enough to avoid attrition among them too because of all this. Some of them will follow. The schism that we’ve all been trying to postpone for 50 or more years is upon us. It’s not going to happen with a parade in Times Square or a big spread in the New York Times. Those days are past. It’s going to be attrition, misunderstanding, friendly invitations, family expectations, confusion and just plain drifting off in apathy. Note well. 1 in 10 Americans is an ex-catholic. About half of that 10% are unchurched at any give time. Once unchurched, if they rechurch, they are far more likely to choose something other than Catholic. The other half become protestants. Approximately 1/3 of all those raised Catholic leave and many of them leave young. Among all of those who report themselves as being Catholic are the “regular” RCs who have an average mass attendance rate of 25-30% weekly, and then there are all the people who report themselves as being RC who are Independent Catholic, Ecumenical Catholic, dissident Catholic and a whole load of other categories including RR’s category. In the US, we virtually never take anyone off the rolls you understand. Otherwise, we’d see what the studies tell us: There are 4 times as many people who’ve left as those who’ve come into the Church. In Europe and the UK, where taxes are levied against Catholics which involves some bookkeeping, you can see the picture more clearly. It’s not good.